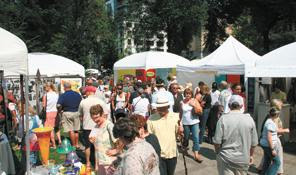 The 21st Annual Art In The Pearl Fine Arts and Crafts Festival will be held Labor Day weekend. It is located in one of the most beautiful areas in the Pearl District in Portland, Oregon. The festival is rated one of the top ten art festivals in the country featuring the artwork of 130 artists. Drawing an estimated 75,000 attendees, Art In The Pearl features exceptional visual artists, artist demonstrations, an interactive art area for children of all ages, a songwriters stage, and a variety of unique food. Our Emerging Artist Program provides artists in the early stage of their art career, an opportunity to gain experience marketing their work at one of our nation’s premier art festivals. Art In The Pearl is developed and produced by a dedicated volunteer board committed to stewardship and reaching out to our community through art, education, and entertainment.